I am really liking the yellow, cream and gray color palate right now. I'm thinking of repainting my bedroom gray with cream accents and a fresh yellow patterned comforter. Still looking for some more inspiration. 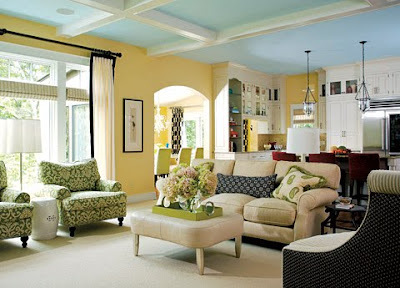 The light blue ceiling is intrigueing, all my ceilings are sort of white.